This article provides comprehensive step-by-step instructions for the acquisition of whole-body 2-deoxy-2-(18F)fluoro-D-glucose (18F-FDG) PET/MRI scans for cancer staging of pediatric patients. The protocol was developed for children above 6 years, or old enough to comply with breath-hold instructions, but can be used for general anesthesia patients as well. Pareek, A., Muehe, A. M., Theruvath, A. J., Gulaka, P. K., Spunt, S. L., Daldrup-Link, H. E. Whole-body PET/MRI of Pediatric Patients: The Details That Matter. J. Vis. Exp. (130), e57128, doi:10.3791/57128 (2017). Integrated PET/MRI is a hybrid imaging technique enabling clinicians to acquire diagnostic images for tumor assessment and treatment monitoring with both high soft tissue contrast and added metabolic information. Integrated PET/MRI has shown to be valuable in the clinical setting and has many promising future applications. The protocol presented here will provide step-by-step instructions for the acquisition of whole-body 2-deoxy-2-(18F)fluoro-D-glucose (18F-FDG) PET/MRI data in children with cancer. It also provides instructions on how to combine a whole-body staging scan with a local tumor scan for evaluation of the primary tumor. The focus of this protocol is to be both comprehensive and time-efficient, which are two ubiquitous needs for clinical applications. This protocol was originally developed for children above 6 years, or old enough to comply with breath-hold instructions, but can also be applied to patients under general anesthesia. Similarly, this protocol can be modified to fit institutional preferences in terms of choice of MRI pulse sequences for both the whole-body scan and local tumor assessment. Integrated Positron Emission Tomography (PET)/Magnetic Resonance Imaging (MRI) enables cancer staging and treatment monitoring with high sensitivity, high soft tissue contrast, and added metabolic information1,2,3,4. In adult patients, PET/MRI performed equally well as PET/CT for staging of established cancers5,6,7. In the future, liquid biopsies will likely lead to earlier detection of cancer development (e.g., through transcriptomes and circulating DNA) and require more sensitive imaging tests than are currently available to find small tumors in the body8. This might put PET/MRI into a superior position to evaluate the whole body and detect cancers in anatomical areas that have been classically evaluated with MRI alone, such as the brain, neck, abdomen/pelvis, and musculoskeletal system. For pediatric patients, PET/MRI has several advantages over PET/CT: First, PET/MRI provides a markedly reduced radiation exposure of the patient by up to 74%4. This can be achieved by using ionizing radiation-free MRI instead of CT technologies for anatomical co-registration of PET data. In addition, the increased sensitivity of modern PET detector systems9 and longer PET data acquisition during an MRI scan enables significant reduction of administered radiotracer doses by 30-50% compared to current PET/CT protocols4. Second, the possibility of combining staging scans of the primary tumor and the whole body saves time and avoids duplicate sedations for some patients, such as patients with bone and soft tissue sarcomas. However, a "one stop" staging scan is only clinically feasible if all PET/MRI data (local tumor and whole body) can be acquired in an efficient manner and if the abundance of resultant image data is presented in an easily digestible format to the radiologist. The protocol presented here will provide step-by-step instructions for the acquisition of PET/MRI data that can be used for clinical staging of children with cancer, with particular attention to specific needs of the pediatric population. All methods presented here have been established under a research study, which was approved by the institutional review board of Stanford University. The "off label" use of ferumoxytol was performed under an investigator-initiated investigational new drug application (IND 111,154). Screen the patient for potential magnetic field hazards using an MRI safety questionnaire. If the administration of intravenous MRI contrast agent is planned, check contraindications, such as history of allergies and kidney function, among others. Inform the patient of purpose, procedure, risks and benefits prior to the scan. Weigh the patient for calculation of radiotracer and contrast agent dose. Ask the patient to fast for at least 4 hours before the scan. Ask the patient to remove all metallic objects and change into a gown. If there are any implanted metallic objects, make sure that they are safe for MRI scanning. Use a metal detector as needed. Do not perform the PET/MRI if there is a concern for patient safety. Place an intravenous line in a peripheral superficial vein or access a port-catheter. Dilute ferumoxytol (5 mg Fe/kg bodyweight) 1:4 in saline, and infuse slowly over at least 15 min according to FDA protocols10. Note: Ferumoxytol can be used "off label" as a contrast agent through an investigator-initiated IND, because it provides long lasting vascular and tissue enhancement for the duration of the entire scan. Alternatively, a cyclic gadolinium chelate can be administered directly before start of the PET/MRI scan. For patients with liver lesions, gadoxetate disodium may be chosen. Check the patient's blood-glucose levels with a glucometer.If the patient's blood-glucose levels are above 200 mg/dL, consider re-scheduling the PET/MRI scan. 45 min prior to the PET/MRI scan, administer 2-deoxy-2-(18F)fluoro-D-glucose (18F-FDG) at a dose of 2 MBq/kg bodyweight in 1 mL of saline through the intravenous line. Note: For this protocol, we used a 3.0 Tesla GE Signa integrated PET/MRI system bundled with MP24_R03 scanner software. Save the protocol for the whole-body scan (Table 1) and local tumor scan (Table 2) on the scanner, so that these can be easily retrieved without losing much time to search sequences or adjust protocols. For patients with lymphoma, prescribe a whole-body scan only, either extending from head to toe or extending from head to mid-thigh level, according to the clinical oncologist's request. For all other patients, prescribe a whole-body scan from head to toe followed by a separate local tumor scan. If a tumor is already appropriately centered in one of the whole-body PET slabs, prescribe and run the dedicated MRI sequences during the whole-body scan in order to save time; e.g., an abdominal tumor can be scanned with the whole-body coil. To enable easy retrieval and review of PET/MRI data for the Radiologist, save the "diagnostic" images under one accession number. Later (see step 4.3.5) save the source images under a second accession number in the PACS system. Use the same localizers throughout the scan and make sure the patient doesn't move for the duration of the scan. This enables co-registration of the acquired PET and MRI data later. Prescribe the necessary MRI sequences within each PET slab. The integrated PET/MRI system then allows for the simultaneous acquisition of PET data and MRI data. Ask the patient to void directly before entering the scanner room. Position the patient on the PET/MRI table in a supine position. If the patient cannot lay supine, scan the head supine and the whole body in prone position. For very tall patients, acquire the lower legs in a second step. For patients with bone or soft tissue sarcoma, make sure to cover the whole affected bone from joint to joint (e.g., whole femur from hip to knee joint). Close a breathing belt around the patient. Then position a head coil and 2-3 surface coils on the neck, chest, abdomen, pelvis and extremities of the patient. Acquire whole-body localizers in three planes; axial, coronal and sagittal (Table 1) using the generic localizer protocol. Select the number of stations according to patient height. Scanning direction can be either from head to feet or feet towards head. Prescribe the entire protocol before starting the whole-body scan. Streamline this process and use a pre-saved protocol so that children do not lose patience. Prescribe axial PET slabs first, using the maximum axial field of view (FOV, typically 25 cm) and 3 min data acquisition. Depending on patient size, 4-5 slabs will cover head to mid-thigh and 9-10 slabs will cover the whole body. In the scanner software, enable two separate reconstructions for the PET data: one non-attenuation corrected (NAC) PET and one MRI attenuation corrected (MAC) PET. Use a matrix size of 192 x 192. Use 28 subsets with 2 iterations. The PET/MRI software allows for attenuation correction accounting for patient, patient cradle and dedicated MRI coils using sequences described under 3.7.7 below. Fill each PET slab with a low-resolution Liver Acquisition with Volume Acquisition (LAVA) sequencefor Attenuation Correction (MRAC) and a higher resolution LAVA sequence for anatomical co-registration of 18F-FDG-PET data. Diffusion-Weighted Images (DWI) can be added as deemed appropriate (Table 1). In the Task menu select the PET Task, click Add Task, click Add Postprocessing, choose MRAC Autobind (User) and then click Setup which will bring up an additional menu. Select all consecutive Water MRAC for the PET slabs and click Accept. This will enable the software to automatically merge the MRAC. Apply similar steps to merge the DWI. In this case, choose the first PET slab and click on the DWI sequence. Then click Add Task and follow the same additional steps as in 3.7.8. Add a dedicated T2-sequence for evaluation of the lungs and/or mediastinum (Table 1). Place an appropriate coil over the primary tumor. For extremity tumors, a flex coil may be used. For bone tumors, make sure to cover the adjacent joint (e.g., for an osteosarcoma of the distal femur metaphysis, include the distal femoral epiphysis and knee joint). For primary tumors of the neck, chest, abdomen and pelvis, placement of coils for local tumor and whole body staging can be done at once (see step 3.7.2). The separate materials/equipment list provides an overview of PET-compatible MRI coils available on the scanner. Note: To obtain the merged whole-body PET/MRI scan, the following four steps must be done: 1) reconstruct the PET image data, 2) merge the individual MRI data acquisitions to a single image volume, 3) co-register the PET to the MRI data, and 4) generate a PET whole-body maximum intensity projection (MIP). The scanner software greatly simplifies these steps. Select all individual MRI data sets of a specific sequence, e.g.,LAVA 1 through 9, and press the Autobind button. The software then constructs a merged MRI data set. Save the merged MRI data set. The software automatically names the data set and adds it to the series list. To co-register the merged MAC PET-data and merged LAVA-data, select each data set which needs to be co-registered and press the ImageQC button. The software then shows both the individual non-co-registered data sets and the co-registered data set in two planes in six separate windows. Select the MRI data and window-level appropriately, since this cannot be adjusted once the co-registered scan is finalized and saved. Similarly select the co-registered PET/MRI data set and window-level the PET data. It is also possible to adjust opacity, zoom and position of the co-registered data before saving. Choose the appropriate slice orientation for the co-registered data set, i.e., axial or coronal. Choose Batch in the Film/Save menu. Select Loop and scroll all the way to the most cranial slice and click Set Start, then scroll down to the most caudal slice and click Set End. In the description field, choose an appropriate filename. Use a consistent and easily recognizable file name for all studies, so that the radiologist and clinician can easily find a specific data set (e.g., PET-LAVA Whole-Body). Click Preview and let the scan scroll from head to toe while checking that the final result is acceptable in terms of fusion accuracy and window levels. Close the preview and then select OK to start rendering the PET/MRI scan. The rendering process can be followed by observing the image index track bar. Follow the same steps to co-register the MAC PET-data and the dedicated T2 MRI sequence for evaluation of the lungs. Since the PET-data FOV extends beyond the MRI, set the start and end of the scan to include only the co-registered part. Note: The local PET/MRI can be co-registered following the same steps. To generate a PET whole-body maximum intensity projection (MIP), select the MAC PET and any MRI data set and press the ImageQC button. Double-click on the window with PET data only, and hover the cursor in the upper left corner to select View Type, and then select VR. This will create a 3D reconstruction of the PET data. Again, hover the mouse in the upper left corner to select rendering mode and then select HD MIP to finally create the PET whole-body MIP overview. To save the MIP overview choose Batch in the Film/Save menu and select Rotate. Adjust the number of images to 60. In the description field choose an appropriate file name. Click Preview and check that the final result is acceptable. Close the preview and then select OK to start rendering the MIP overview. Make sure the rendering is complete before you exit. Send the diagnostic image data sets to the institutions Picture Archiving and Communication System (PACS) by selecting the appropriate series and click on the desired Network in the Destinations menu. To save the source images under a different accession number, click Edit Patient and change the accession number. Then repeat the send procedure. Load the co-registered PET/MRI data in an FDA-approved medical imaging viewer to read and analyze the scan. Commercial PET/MRI viewers allow for measurement of the maximum Standardized Uptake Values (SUV) in 3D. Note: For this specific protocol, we used MIM version 6.6. Choose Calculate SUV statistics from the tool bar. Position the region of interest (ROI) around the tissue exhibiting pathological 18F-FDG uptake on the co-registered PET/MRI. The ROI diameter can be enlarged by holding and dragging with the right mouse button. The software will determine both the mean and maximum SUV value. For patients with lymphoma, measure the liver and mediastinal blood pool as a standard of reference. Follow institution-specific guidelines for reporting of SUV measurements. We demonstrate an integrated whole-body (head to toe) data set of MRI, PET and fused PET/MR images, respectively, respectively, of a 10 year-old boy with status post resection of an undifferentiated sarcoma of the 12th rib, who presented with pulmonary and cardiac metastases (Figure 1). The data set shown here was acquired within 40 min. The effective dose of the patient during this exam was 3.3 mSv11. For patients who receive a dedicated scan of the primary tumor, in addition to the whole-body head-to-toe PET/MR image acquisition, the combined scan can be performed in 60-90 min, depending on the location and size of the primary tumor and the length of the patient. Figure 1: Result of whole-body PET/MRI acquisition using protocol. 18F-FDG PET and ferumoxytol-enhanced MRI images of pulmonary and cardiac metastases of a 10 year-old boy with status post-resection of an undifferentiated sarcoma of the 12th rib. Images show multiple hypermetabolic pulmonary metastases as well as a metastasis in the right ventricular outflow tract of the heart. Whole-body coronal (A) LAVA MRI data, (B) MRI Attenuation Corrected PET-data, and (C) co-registered PET and merged LAVA MRI data. Please click here to view a larger version of this figure. Table 1: Magnetic resonance imaging pulse sequence parameters for whole-body scan. MRI pulse sequence parameters for each acquisition of the whole-body PET/MRI scan. Table 2: Magnetic resonance imaging pulse sequence parameters for local tumor scan. MRI pulse sequence parameters for the primary tumor scan. Note that not all sequences are applied for each tumor (see Table 3). Respiratory-triggered (RT), Fast Recovery Fast Spin Echo (FRFSE). Table 3: Magnetic resonance imaging sequences for local tumor scan. MRI sequences for the primary tumor scan depending on tumor localization. We have shown a step-by-step protocol for PET/MRI studies of pediatric cancer patients. The most critical part of the protocol is time-efficient planning and prescribing the PET-slabs and MRI sequences with the correct parameters and in the correct consecutive order before initiating the whole-body scan. This enables continuous acquisition of the entire body. Efficient scanning is especially important in the pediatric setting, where unsedated patients can easily lose patience and either start to move or abort the exam if it takes too long. Therefore, it is important to carefully choose the direction of the scan (head-to-toe or toe-to-head, primary tumor first or whole body first, depending on priority). Apparently simple preparation steps such as asking the patient to void directly before entering the scanner can have major impact on image quality. Pediatric tumors can usually not be scanned with a "one fits all" approach and require prescription of tailored PET and MRI scan parameters for evaluation of the primary tumor. Our PET/MRI protocol has been tailored to the specific needs of children with regards to both the chronological sequence of image acquisitions and the specific scanning parameters4. Our goal was to devise a protocol which would acquire high-quality diagnostic images, while keeping scan time at a minimum. This protocol was originally developed for children above 6 years,or old enough to comply with breath-hold instructions. The protocol can be also applied for younger patients under general anesthesia by either also using breath-hold MRI sequences for anatomical orientation or by using ultrafast sequences with free breathing acquisition modes. Furthermore, while table 3 provides our choice of MRI pulse sequences for assessment of the primary tumor, these can easily be modified or expanded to fit institutional preferences. In conclusion, the protocol presented here shows how acquisition of whole-body PET/MRI for pediatric cancer staging can be realized. Given that PET/MRI has several advantages over PET/CT including markedly reduced radiation exposure, better soft tissue contrast and equal or improved sensitivity for cancer staging, it appears possible to replace some pediatric PET/CT studies by PET/MRI. This work was supported by a grant from the Eunice Kennedy Shriver National Institute of Child Health and Human Development, grant number R01 HD081123-01A1. Anuj Pareek is a visiting Ph.D. student from the Department of Radiology, Aarhus University Hospital, Denmark. The authors acknowledge technologists Dawn Holley and Harsh Gandhi from the PET/MRI Metabolic Service Centre for their assistance with the acquisition of PET/MRI scans. We thank members of the Daldrup-Link lab, the PET/MRI service center, the Molecular Imaging Program at Stanford, the Radiological Science Lab, the Pediatric Radiology Section, the Stanford Cancer Institute and the pediatric oncology team at Lucile Packard Children's Hospital for helpful discussions and support of this project. Pichler, B. J., Judenhofer, M. S., Wehrl, H. F. PET/MRI hybrid imaging: Devices and initial results. Eur. Radiol. 18, (6), 1077-1086 (2008). Torigian, D. A., et al. PET / MR Imaging : Technical Aspects and Potential Clinical Applications. Radiology. 267, (1), 26-44 (2013). Daldrup-Link, H. How PET/MR Can Add Value For Children With Cancer. Curr. Radiol. Rep. 5, (3), (2017). Muehe, A. M., et al. How to Provide Gadolinium-Free PET/MR Cancer Staging of Children and Young Adults in Less than 1 h: the Stanford Approach. Mol Imaging Biol. (2017). Spick, C., Herrmann, K., Czernin, J. 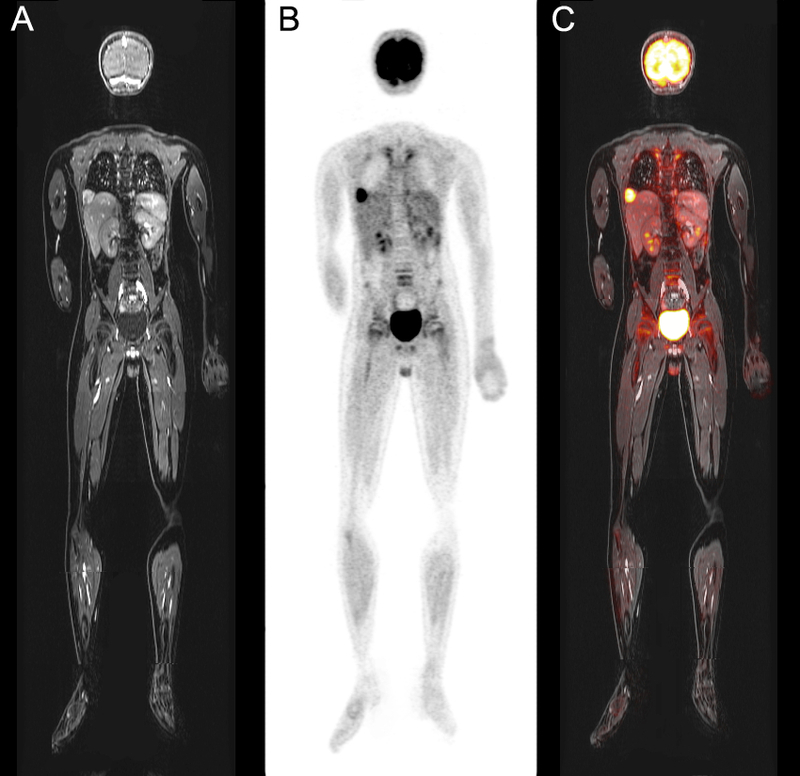 18F-FDG PET/CT and PET/MRI perform equally well in cancer patients: Evidence from studies in more than 2300 patients. J. Nucl. Med. 57, (310), 1-38 (2016). Sher, A. C., et al. Assessment of sequential PET/MRI in comparison with PET/CT of pediatric lymphoma: A prospective study. Am. J. Roentgenol. 206, (3), 623-631 (2016). Jadvar, H., Colletti, P. M. Competitive Advantage of PET/MRI. Eur. J. Radiol. 83, (1), 84-94 (2014). Wan, J. C. M., et al. Liquid biopsies come of age: towards implementation of circulating tumour DNA. Nat. Rev. Cancer. 17, (4), 223-238 (2017). Grant, A. M., Deller, T. W., Khalighi, M. M., Maramraju, S. H., Delso, G., Levin, C. NEMA NU 2-2012 performance studies for the SiPM-based ToF-PET component of the GE SIGNA PET/MR system. Med. Phys. 43, (5), 2334-2343 (2016). FDA Drug Safety Communication: FDA strengthens warnings and changes prescribing instructions to decrease the risk of serious allergic reactions with anemia drug Feraheme (ferumoxytol). https://www.fda.gov/Drugs/DrugSafety/ucm440138.htm (2015). Mattsson, S., et al. Radiation Dose to Patients from Radiopharmaceuticals: a Compendium of Current Information Related to Frequently Used Substances. Ann. ICRP. 44, (2 Suppl), 7-321 (2015).